"In c. 220 B.C., under Qin Shi Huang, sections of earlier fortifications were joined together to form a united defence system against invasions from the north. Construction continued up to the Ming dynasty (1368–1644), when the Great Wall became the world's largest military structure. Its historic and strategic importance is matched only by its architectural significance." -- It was not built all at once and as a single, continuous wall, but rather a discontinuous network of wall segments that took more than 1700 years and a few Dynasties to finish it. -- It is not included as one of the Seven Wonders of the Ancient World, but is one of the Seven Wonders of the Medieval World. -- The Great Wall was called "the longest cemetery on earth" because about one million people died building it. There is a popular legend called Meng Jiang Nu Cried the Great Wall to Fall. Meng Jiang Nu was a wife of a farmer who was forced to work on the wall during the Qin Dynasty. When she heard her husband had died while working the wall, she wept until the wall collapsed. -- In Chinese, the Great Wall of China is called wanli changcheng or Changcheng, meaning Long Wall of 10,000 Li (a li is a measure word for distance, approximately 1/3 mile long). -- The main portion of the Great wall is around 2,145 miles (3,460 km) long with an extra 1,770 miles (2,860 km) of branches and spurs. 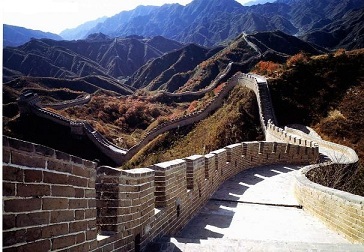 -- The first section of the wall to open to tourists is in Badaling near Beijing in 1957. It is also the most visited section of the Great Wall. -- The initiation of the building of the Great Wall was as early as the seventh century B.C., when the seven states fought for sovereignty. The seven states were Chu, Qi, Wei, Han, Zhao, Yan, and Qin. -- Before the Ming dynasty, the wall was built with rammed earth, adobe, and stone. What survives today are the stone and brick walls predominately from the Ming dynasty (1368-1644). -- The mortar used in building the Great Wall was made from rice flour. -- According to legend, a helpful dragon traced out the course of the Great Wall for the workforce. The builders subsequently followed the tracks of the dragon. -- Voltaire (1694-1778) thought the Egyptian pyramids were "childish" compared to the Wall, which was a "great work." He also called the Wall a "monument to fear." -- The Great Wall is on the list of World Heritages and is a unifying symbol of China the nation. However, during the Chinese Cultural Revolution (1966-78), the Great Wall was seen as sign of despotism, and people were encouraged to take bricks from it to use. More of the Great Wall of China Facts. Art of War, a world classic writing on war. It's known as "Sun Wu's Military Science". World Heritage Sites in China. Chinese Kung Fu / Chinese Martial Arts.